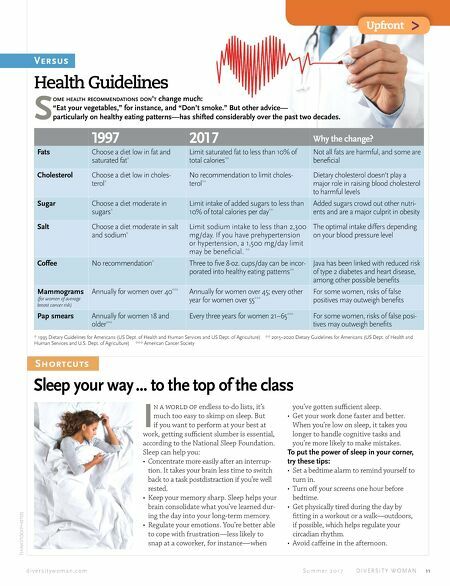 d i v e r s i t y w o m a n . c o m S u m m e r 2 0 1 7 D I V E R S I T Y W O M A N 11 THINKSTOCKPHOTOS Shortcuts Sleep your way ... to the top of the class Health Guidelines Versus 1997 2017 Why the change? Fats Choose a diet low in fat and saturated fat * Limit saturated fat to less than 10% of total calories ** Not all fats are harmful, and some are beneficial Cholesterol Choose a diet low in choles- terol * No recommendation to limit choles- terol ** Dietary cholesterol doesn't play a major role in raising blood cholesterol to harmful levels Sugar Choose a diet moderate in sugars * Limit intake of added sugars to less than 10% of total calories per day ** Added sugars crowd out other nutri- ents and are a major culprit in obesity Salt Choose a diet moderate in salt and sodium * Limit sodium intake to less than 2,300 mg/day. If you have prehypertension or hypertension, a 1,500 mg/day limit may be beneficial. ** The optimal intake differs depending on your blood pressure level Coffee No recommendation * Three to five 8-oz. cups/day can be incor- porated into healthy eating patterns ** Java has been linked with reduced risk of type 2 diabetes and heart disease, among other possible benefits Mammograms (for women of average breast cancer risk) Annually for women over 40 *** Annually for women over 45; every other year for women over 55 *** For some women, risks of false positives may outweigh benefits Pap smears Annually for women 18 and older *** Every three years for women 21–65 *** For some women, risks of false posi- tives may outweigh benefits * 1995 Dietary Guidelines for Americans (US Dept. of Health and Human Services and US Dept. of Agriculture) ** 2015–2020 Dietary Guidelines for Americans (US Dept. of Health and Human Services and U.S. Dept. of Agriculture) *** American Cancer Society S ome health recommendations don't change much: "Eat your vegetables," for instance, and "Don't smoke." But other advice— particularly on healthy eating patterns—has shifted considerably over the past two decades. Upfront > I n a world of endless to-do lists, it's much too easy to skimp on sleep. 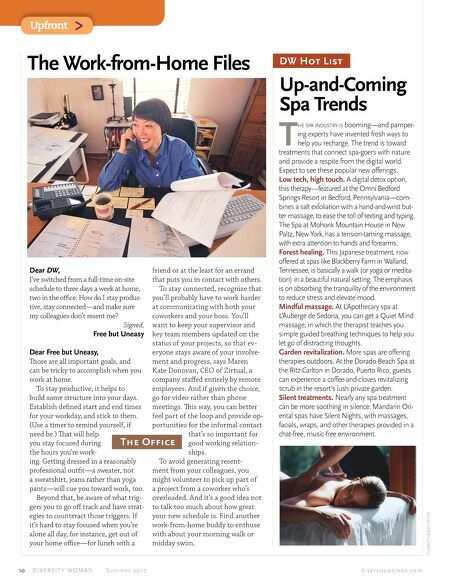 But if you want to perform at your best at work, getting sufficient slumber is essential, according to the National Sleep Foundation. Sleep can help you: • Concentrate more easily after an interrup- tion. It takes your brain less time to switch back to a task postdistraction if you're well rested. • Keep your memory sharp. Sleep helps your brain consolidate what you've learned dur- ing the day into your long-term memory. • Regulate your emotions. You're better able to cope with frustration—less likely to snap at a coworker, for instance—when you've gotten sufficient sleep. • Get your work done faster and better. When you're low on sleep, it takes you longer to handle cognitive tasks and you're more likely to make mistakes. To put the power of sleep in your corner, try these tips: • Set a bedtime alarm to remind yourself to turn in. • Turn off your screens one hour before bedtime. • Get physically tired during the day by fitting in a workout or a walk—outdoors, if possible, which helps regulate your circadian rhythm. • Avoid caffeine in the afternoon.